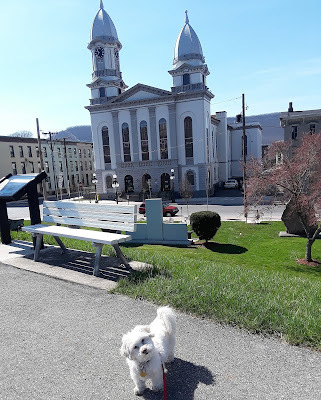 On the way to and from the BlogPaws conference in Kansas City, we stopped off in the quiet, historic town of Lock Haven, Pennsylvania. 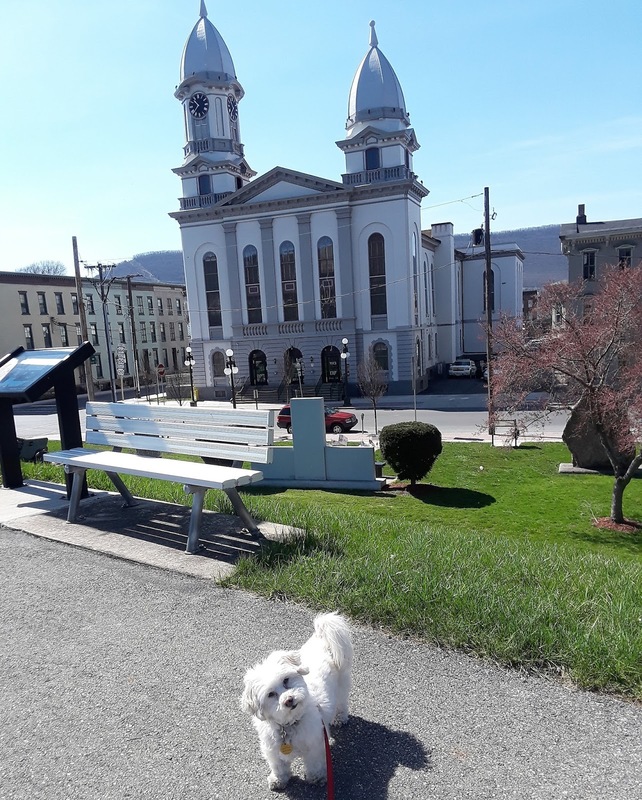 It's a very dog friendly little town with a beautiful river running through it. The town is also home to Lock Haven University, a college with just under 4,000 students. The William Clinger Riverwalk is a beautiful paved walkway that runs along the river for 2.25 miles. The river is actually a levee that protects Lock Haven from the West Branch Susquehanna River. The Riverwalk is a nice long path that is very dog friendly and great for long walks. 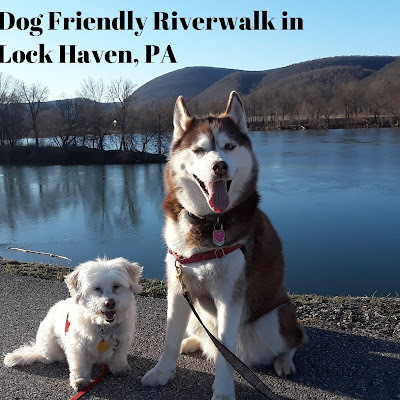 We love visiting Lock Haven because the riverwalk offers a great way for both us and the dogs to get good exercise and take time to enjoy ourselves when we stop off during long road trips. I would actually visit this dog friendly town for this beautiful riverwalk alone! 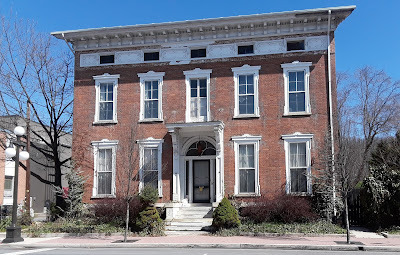 It's the end of Winter in these photos, but it's even more beautiful in Summer when all the trees have leafed out and bloomed. I hope to visit in the Fall next time when the blazing colors of the Northeastern Fall foliage are in full swing. I know that will be spectacular here! The riverwalk is a great place for Icy and Phoebe to go exploring together. Lock Haven isn't exactly a bustling town. There are a few little shops and restaurants, but it's a very quiet little college town. That's what we love about it. It's peaceful and quiet, you can enjoy the riverwalk and lovely architecture without worrying about crowds or finding a place to park. Some parts of the town seem kind of run-down, but there is still a lot of beauty to enjoy - especially that wonderful riverwalk! During one of our cross country trips from Phoenix to New York we searched for a dog friendly hotel that was not too far from Interstate 80. 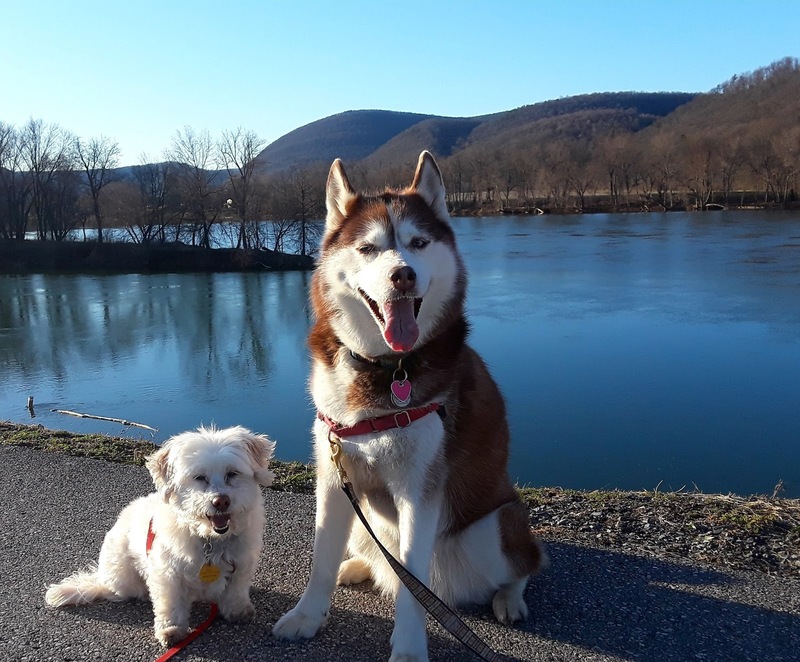 I was so fortunate to find a pet friendly Best Western hotel in the town of Lock Haven, Pennsylvania. Finding this town and hotel were one of those happy accidents while planning a cross country road trip with two dogs! We've stayed at this Best Western hotel 4 times in the past couple of years and we love it. The staff is so friendly and accommodating, and they definitely welcome their pet guests! Phoebe made herself right at home in our comfortable hotel room! The rooms are updated, clean and very comfortable. They offer free breakfast too. The best thing about this hotel is that it's only a short walk from the hotel to the riverwalk. We've enjoyed all our stays at this Best Western hotel, and will definitely return soon! 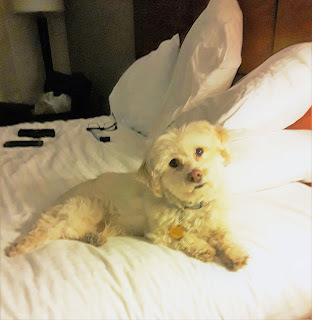 When I find a great hotel that really welcomes dogs I try to go back to it again and again on our many road trips with the dogs. 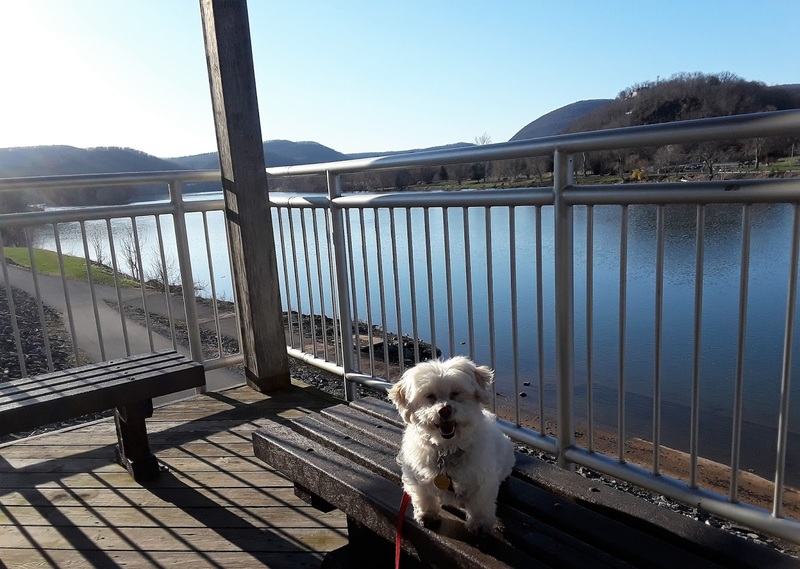 In Summer, Lock Haven has a lot of events that take place along the riverwalk, such as the free Summer concert series that takes place on a floating stage right on the river! We love visiting Lock Haven Pennsylvania, it truly is a haven, and a nice break from surrounding big cities like Pittsburgh and Philadelphia! Have you found other dog friendly riverwalks? Tell us about it in the comments! LINK UP WITH US ON THE PET PARADE BLOG HOP!! what a gorgeous place to walk! I just love Pennsylvania, such a beautiful state. When I was a kid I lived in Pittsburgh from age 2 til age 7...oh those hills! Isn't it beautiful! I think it's a very underrated place. Between the Poconos, Camelback ski area, and all the beautiful woods in PA it should get more attention. Pittsburgh is a cool city, so it Philly! Lovely place to hang out I think. Looks like Phoebe had a great time. It isn’t always the easiest thing to find a good pet hotel. If I’m ever in the area I’ll check that hotel out. It was so nice being by the river in a quiet town, we all loved it. It can be so hard to find good pet friendly hotels that are clean, updated, with friendly & welcoming staff. This Best Western has all that. Keep it on your radar. What a beautiful place and the walk looked amazing, I love small places like this as the architecture etc is just so unique. That riverwalk is such a find I love finding great out of the way places that are pet friendly. We loved it here. Such a lovely place, and looks so tranquil. I like that it's long enough should you want a longer stroll alone or with the dogs. With such an accommodating pet friendly hotel, it seems like a great weekend getaway. It's a wonderful weekend getaway, I can't wait to go back this Summer and again in the Fall when the foliage is at it's peak! The riverwalk is a nice long walk. You can also go across the bridge to a big park area - we didn't get there but next time I'd like to. How beautiful. I've never been to Riverwalk, PA but I have been to Hawley,PA and love the quaint small town feel of the town. PA has so many places to visit and spend a relaxing weekend or short stay. That photo with Phoebe in front of the building is too cute. Nice video footage too. It looks like a movie backdrop. It's actually in a town called Lock Haven, PA. The Riverwalk is just the name of the actual walk along the river in Lock Haven. This is a very small town, quiet and not crowded. I love PA, there are so many great places to visit! Such a beautiful area! I bet it is truly beautiful in full bloom. I love hearing about these dog-friendly places! And might I add, miss Phoebe looks nice and comfy in the hotel room! Pinning! It is so pretty, these photos barely do it justice. It's much nicer in Summer when all the trees have leafed out & flowers are in bloom. I'm dying to go there in the Fall for a Fall foliage visit! Thanks so much for pinning this, much appreciated Dorothy. Thanks for joining the Pet Parade! I didn't realize there was such a thing as a quiet college town. LOL! It is a beautiful place. Thanks for co-hosting the Pet Parade! I know, that sounds like an oxymoron, right? But it really is a college town and it's real quiet there. Maybe on Saturday nights it picks up but it seems pretty sedate to me. 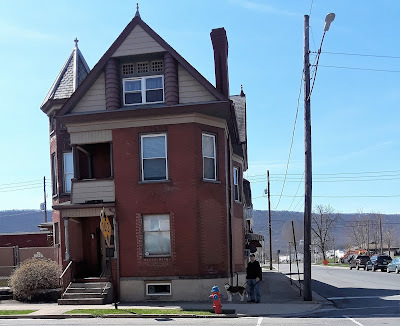 I've never been to Lock Haven, but I did go to high school and college in Western Pennsylvania, so the architecture style is very familiar to me. I love old houses like those. It looks like a lovely town, and I'm glad to know that the Best Western is so pet friendly. Oh wow, I didn't know you lived in PA! I love Western PA, the natural beauty is so lovely. We always enjoyed driving through there on our warm weather cross country drives. This town is so quiet, and that riverwalk is amazing. This hotel is great for a pet friendly getaway. What a charming town! It's good to plan out your dog-breaks in nice places like this. How long was your drive? It was so perfect, we really got a chance to recharge on the way home from the conference. We drove over 1200 miles each way from Long Island to Kansas City! By the end of the conference & all that driving we really needed the break! We took a long walk along the river the evening we checked in and another long walk in the morning before heading back to Long Island. It was great! You guys are amazing and I love your photos. Not that I am jealous of your fabulous road trip and Phoebe ad Icy looking so cute ;-) I love you guys. Aww, thanks Marjorie, you're pretty amazing yourself! Don't be too jealous of our road trip, it was SO long. We drove 2.5 days each way! This was the only time we really got to enjoy our road trip. Gosh that water looks so beautiful! Very clean and blue. I have never heard of Lock Haven, PA, but it looks like a quaint little town and worth a trip. The first photo is so adorable! We have a very nice riverwalk in downtown Chicago. I haven't taken Ruby there yet because I'm not sure how she would do with the crowds. It's a popular place with tourists with lots of outdoor dining, etc. I hope to take her there this summer but need to find a time when it is off hours and not so many other people or dogs around. I love this riverwalk area, it's perfect exercise for all of us and a great dog friendly area. It's nice & long and the dogs just loved exploring every inch of it. You should try to take Ruby to your river area - go during the week when it's most empty, maybe a Wed. morning? A short trip when it's not too crowded might be good for her. Let us know if you do that! That is a place Jasmine would have loved. The river bit at least, anyway. She just adored water. Streams, ponds, lakes, even puddles. Couldn't get enough of it. There was a train we used to go on, mostly cleaned-off flat(ish) rock. So water pooled all over the place ... the trail of a thousand puddles. You could count them without looking at them, just by the splashing sounds of Jasmine checking (and walking through) every single one of them. Oh wow, that sounds like a beautiful trail! Icy loves that kind of thing. I need to find more places like that for the dogs here in NY - upstate may have some that dogs are allowed in. Sadly, it's not that dog friendly here. I was born and raised in Western PA but don't believe I've every visited Lock Haven. I will have to put that on my list. 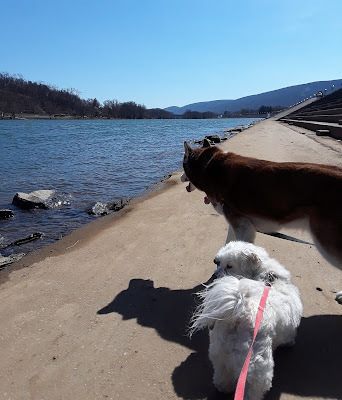 There are so many fun places to go in PA. Another dog-friendly town where you can walk along the river is Austin, Texas. There are dogs everywhere there and on those hot summer days, they cool off in the river. Lock Haven looks so charming! And that Riverwalk looks so calming and soothing! I love walking Rooney next to bodies of water! Thank you for sharing! Indeed a lovely place that river walk is gorgeous and the smiles on yoru dogs are priceless. I bet they had a wonderful time. I ho one day fo rus to visit Pennsylvania. I live in Orlando we do not have something like this but we have dog parks and the beach. What a beautiful location! You always find the nicest dog-friendly locations in your travels. It was great to see you at BlogPaws again.